Formal Inauguration of the IRDIS, by the Hon’ble Chief Minister of Assam, Shri Tarun Gogoi, on 19 March 2012 at the International Convention Center, Srimanta Sankardeva Kalakshetra, Guwahati. Shri Tarun Gogoi is the Chief Patron of IRDIS. The Guest of Honour for the Inaugural Ceremony was Prof. C. Matthew Snipp, Burnet C. and Mildred Finley Wohlford Professor of Humanities and Sciences in the Department of Sociology and Chair of NativeAmerican Studies at Stanford University,USA. The event was attended by various ethnic community members of the Singpho, Rabha, AmriKarbi and Tai Ahom tribes besides others. Signing of the Memorandum Of Understanding between IRDIS and Stanford University, CA, USA, on 19 March 2012 at the Office of IRDIS at Srimanta Sankaradeva Kalakshetra, Guwahati. The Center for Comparative Studies on Race and Ethnicity (CCSRE), Native American Studies (NAS), a program within CCSRE, and the Woods Institute for the Environment (WIE) at Stanford University are the signatories to this MoU. 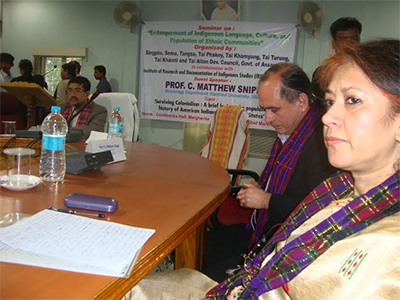 Prof. C. Matthew Snipp delivered a talk on the ‘Assimilation and Self-Determination: The dilemmas confronting indigenous ethnic communities’ at the Phanidhar Dutta Hall, Gauhati University on 20 March 2012. The event was jointly organized by IRDIS and the Department of Linguistics, Gauhati University. The Seminar was addressed by Dr.Tamuli, Head of the Department of Linguistics, Gauhati University and Dr.Deepa Dutt, Executive Director , IRDIS. The faculty members, students and research scholars of the different disciplines of the Gauhati University participated in the Seminar. Seminar on “Endangerment of Indigenous Language, Culture and Population of Ethnic Communities”, organized by Singpho, Sema, Tangsa, Tai Phakey, Tai Khamiyang, Tai Turung, Tai Khamti and Tai AitonDevelopment Council, Govt. of Assam, in collaboration with IRDIS on 22 March 2012 at the Conference Hall, Margherita,Tinsukia district, Assam. The Seminar was addressed by Mr.ManjelaSingpho, Chairman of the Development Council of Margherita and Dr.Deepa Dutt, Executive Director, IRDIS.Prof. C. Matthew Snipp of Stanford University, California, USA, Guest Speaker at the Seminar, made a power point presentation on the topic “Surviving Colonialism: a brief look at the population history of American Indians in the United States”. The members of the eight ethnic communities under the Development Council of Margherita including students and research scholars took part in the seminar. Signing of the Memorandum of Understanding between IRDIS and the Asian Rural Life Development Foundation, ARLDF, Guwahati, Assamon 29 August 2012.